This years village litter pick has been arranged for Saturday 16th March. Meet at the Baptist Hall at 9am for your instructions. All equipment provided and maps issued. All children must be accompanied by an adult. Refreshments provided on your return. Help keep the village tidy. Your local MP will be attending from 11am and your District and County Councillors will also be there. So if you want to meet your councillors and have your say within the village then please come along. This email was sent late on 17.1.19 from HDC Environmental Health. I am providing a further update on the fire at Envar, Woodhurst following today’s TCG teleconference. Envar have continued work on site to move unburnt compost away from the current fire to, firstly, prevent further material adding to the fire mass, and secondly to create additional space around the fire to allow the burning material to be spread out to increase the speed of burn, and provide opportunity for more aggressive firefighting activities. Today’s meeting has agreed that on Monday 21st January, next Monday, the next stage of firefighting on this site will commence with active firefighting using the on-site water provision, combined with breaking the burning compost pile. The addition of water to the fire will be monitored by Envar staff and Cambridgeshire Fire and Rescue, but from a residents perspective this may appear to be an increase in smoke from the site, with the combination of what may be a significant amount of steam being generated as the firefighting water turns to steam. This next stage in the firefighting activity will commence from around 0900 hrs. The multi-agency team remain in agreement that this is the best available option to bring the fire to the earliest possible conclusion. Public Health England are satisfied that the current position, as at 1430 hrs today, does not present a health risk to the general local residential population and whilst odour may be present they remain satisfied that the overall health risk is low. Any local residents with health concerns should discuss the concerns with their local GP, or use the NHS non-emergency number 111. Calls, and local GP referrals, are also being monitored by the multi-agency group to ensure that this advice remains appropriate. The latest newsletter from the A14 communication team can now be found by clicking here. Another great read for all. The latest SID results from the period 27.11.18 – 10.1.19 can now be found. Please note the position of the camera means the incoming direction is heading towards Earith and the outgoing direction is heading to Station Road and doesn’t see the speed on the camera. Please note the gaps in the graphs are where the battery had run out. Click here to view the graphs. Any queries please direct to CCC Highways. This was a sell out last time, so get in early…. 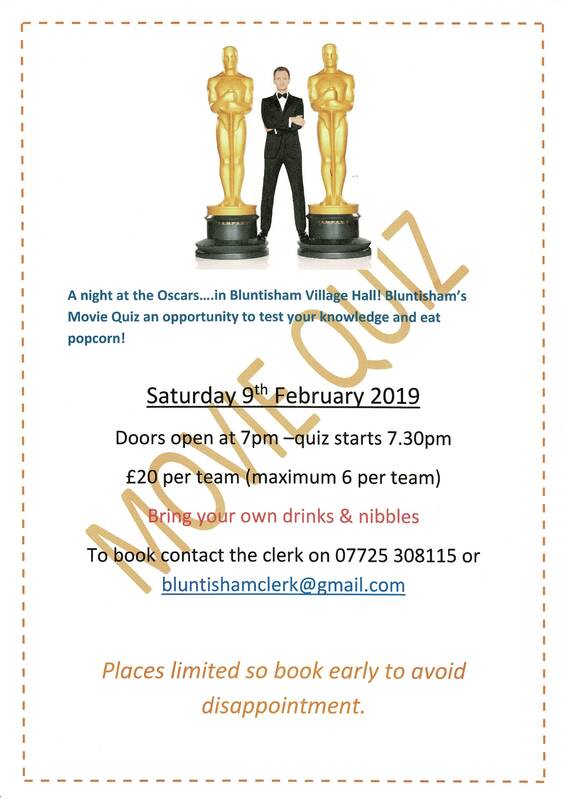 Bluntisham Village Hall are holding a movie style quiz on Saturday 9th February 2019. Teams of 6 only £20 per team. 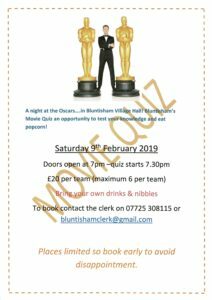 BYO drinks and nibbles and a chance to win a cash prize of £60. As an update following a multi-agency teleconference this morning, involving Cambridgeshire Fire & Rescue, Cambridgeshire Police, East of England Ambulance Service, Public Health England, the Environment Agency, and representatives of District and County Councils. 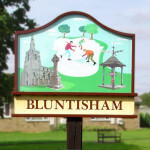 The Fire and Rescue service have been monitoring a fire at Envar Compost, Woodhurst that broke out on the 31st December 2019, with a recent increase in the number of complaints from surrounding residents noted over the last weekend, particularly as the wind was from the west pushing the smoke plume towards Buntisham, but also Somersham and Colne. Today, the wind has moved to a more north westerly, pushing the plume towards Over although a number of smoke and odour complaints continue to be received from the Bluntisham area. Public Health England are satisfied that the current position, as at 10am this morning, does not present a health risk to the general local residential population and whilst odour may be present they remain satisfied that the overall health risk is low. Any local residents with health concerns should discuss the concerns with their local GP, or use the NHS non-emergency number 111. Calls, and local GP referrals, are also being monitored by the multi-agency group to ensure that this advice remains appropriate. In terms of the fire, the Fire Service advise is that the most appropriate action, at least for this week, is to allow the fire to continue to burn and as such burn itself out. The ability to engage active firefighting is restricted due to available space to break down the compost storage piles, but also a concern that applying water will result in a crust forming which will not extinguish the fire, but push the fire into the compost resulting in a longer duration fire. The Environment Agency also expressed some concern regarding the control of water running off the site as a result of active firefighting. At this time, and based on information from the fire since 31st December, it is estimated that the fire will last a further 1 or 2 weeks, with a review of the potential to engage active firefighting expected on Monday 14th January, until this time the fire service, along with the management of Envar, will continue to monitor the situation. This includes visits twice daily by colleagues from Cambridgeshire Fire & Rescue Service. The media strategy is being managed by Cambridgeshire Fire & Rescue Service, and I would encourage, if not already, you to follow the Twitter feeds from Cambridgeshire Fire and Rescue, copied and retweeted on Huntingdonshire District Council where the most current information is being released.